STYLE: The Lance Cali Classic 125 is a unique scooter with a style of its own and extremely easy to ride. It’s the perfect scooter for someone looking to get into the world of biking without having a typical scooter. Inspired by the world of cruisers, its design is characterized by simple and elegant lines, naked handlebars, comfortable seat, high quality paintwork, and elegant chrome. PERFORMANCE: Maximum horsepower is at 8.38 with a top speed of 59 mph. Acceleration is smooth and continuous with a steady flow of power that serves its purpose. It’s perfect for getting around town, but also fast enough for smooth flowing traffic on urban roads. HANDLING: The custom wide handlebars guarantees great road holding. Handling is smooth and the ride is easy and fun. SAFETY: The combination of the 110/70-12 in. front and 3.5-10 rear offers just the right mix of agility and stability. Powerful brakes let you stop in every situation. The large front disc (180 mm) is assisted by an effective rear drum brake (130 mm). 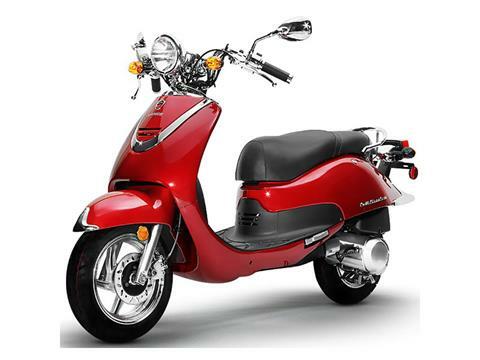 Used together, the brakes stop the scooter fast, with an extremely short braking distance and excellent control of any kind of road surface. COMFORT: The Cali Classic is comfortable and upright and low to the ground. The retro style black seat is broad and wide with a 29 in. low seat height offering an easy and confidence inspiring ride. INSTRUMENT GAUGES: The modern retro three-pod dash cluster instrument panel provides easy to read speedometer, turn signals, and fuel indicator.